The Great Coat And Tie Experiment: This Necktie??!? I have no idea why I purchased this necktie. It's probably because it's one of those Jos A. Bank Signature Collection models that I'm stuck on right now. This one has a somewhat orange (?) background with little blue and tan circles linked together. I had a terrible time conglomerating this thing! Since it had blue circles I decided the blue point collar dress shirt was the most obvious choice. 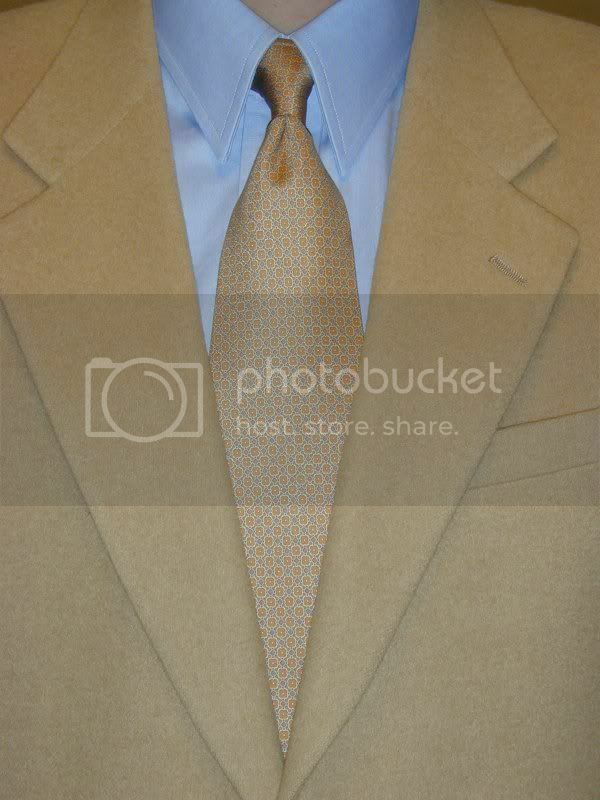 And since it had tan circles the tan sport coat was the most obvious choice. I guess it didn't turn out too bad. That's funny. I just noticed that I wrote "had" instead of "has" when talking of the circles on the tie. Maybe I've already decided to get rid of it and I just don't know it yet. Give the tie a second chance! It's quite subtle, and you have three good colors to work with. How about orange jacket, tan shirt, blue trousers? LOL! I am a Broncos fan so I guess I should have an orange jacket. I do have a couple of different ties fitting for the fandom but those will have to wait a few months. I will give it a second chance! Once I get a tie it becomes too difficult to give it up. It's a sickness with no cure, I think.